Stick to what you’re good at and make it as successful as you possibly can. Brandon Bruce is co-founder of Cirrus Insight, a bootstrapped software company in Knoxville, Tennessee. Cirrus Insight automatically keeps Salesforce CRM up to date for sales teams. It intelligently syncs emails and appointments from Microsoft Office 365 and Google for Work to matching leads, contacts, accounts, opportunities, and cases in Salesforce. Cirrus Insight also includes power tools for salespeople in Outlook and Gmail including email tracking, follow-up reminders, and mail merge templates. Follow them @cirrusinsight. 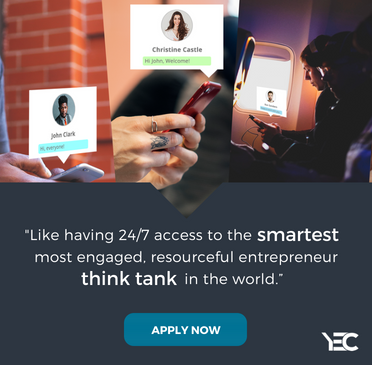 Recently, YEC spoke with Bruce about his experiences building a community for customers and stakeholders in his business, and what others interested could learn about the process. His best advice is below. The value of building a strong community for entrepreneurs is in the ideas. Ideas are oxygen for entrepreneurs. As an entrepreneur, you want to be part of a community so that you have access to “idea flow” in the same way that investors need “deal flow” to source the best investments. Successful entrepreneurs have the ability to identify the most promising ideas from other companies and industries and then remix the ideas for use in their business. For example, we use UserVoice to gather product feedback and ideas from a broad community of users and business owners so that we can continuously improve our software. A list implies one-way communication. You can reach out to a list of customers or subscribers or volunteers or voters. By contrast, a community is characterized by communication among and between members. It’s more dynamic and vibrant and chaotic. And as a result, it’s more valuable than a mere list. Whenever possible, we send out email announcements from a real person on our team, rather than from our company. That makes it easier to invite replies and start conversations. And we frequently direct traffic to our blog where readers can write comments and engage in debate. To establish a community around your business, make it unique. There is “community fatigue” since everybody already belongs to various groups and followings on LinkedIn, Facebook, Twitter, Instagram, etc. Make sure you stand out in the crowd, and make it valuable for members to join the community. You need to quickly get a critical mass of early adopters for the community to take on a life of its own. As a Salesforce partner, we launched our first community for customers and partners using Chatter. We had a thousand or so people in the group and it was different than other online groups because Chatter is a Salesforce-specific tool. As a result, we had a high rate of participation and were able to build a unique community vibe. We started by just focusing on customers. If I were starting again, I would cast a much wider net. The community is so valuable for attracting prospects since they can talk directly with existing customers. (We should have invited prospects to our original Chatter group!) Our customers are our best brand ambassadors and a true extension of our marketing and sales team. Today, I love seeing our customers respond to questions online on LinkedIn, Quora, and in the Salesforce Success Community where they recommend Cirrus Insight to other Salesforce customers. We strive to provide a steady stream of quality content to the community for continuing value and to stoke conversation. We’re a software-as-a-service company. Having a community means we can get almost real-time feedback on our new software releases as well as a constant flow of ideas for future features. For example, we did a massive product release in summer 2013 where we included 67 features that came from customer ideas. We’re about to do the same thing this summer. If you have multiple, intersecting communities, the key is to not reflexively treat them all the same way. Each community is unique. You want to leverage the special features of each platform. A lot of social platforms let you simultaneously post to LinkedIn, Facebook, and Twitter. In our experience, it’s best to write separate posts for each network to take advantage of the style and features unique to each community. It’s tempting to start a community on every platform, but it can be difficult if you don’t have the internal bandwidth to manage every platform. Instead, it’s typically better to choose one platform — the one that appeals the most to your constituents — and focus all your energy there. Lately, we’ve been most focused on speaking with customers, partners, and prospects via LinkedIn. We’re having meaningful conversations about B2B sales and the unique opportunities and challenges of delivering SaaS. And we continue to get great value form UserVoice where customers and prospects vote on new features. We have touch points across many platforms, but that’s only possible since our marketing team has grown. Focus is key, no matter your size.